Useful basic information, but will all this switching and modulation shorten the life of an LED luminaire. Imagine the amount of minute switching the fitting would do in a shopping mall, still not sure regarding the security of a system, a hack to the server would still infect a lot of users. 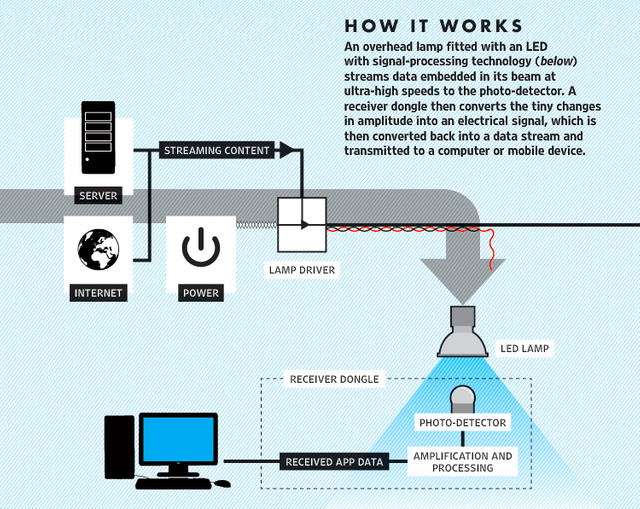 How does LiFi work? When a constant current is applied to an LED light bulb a constant stream of photons are emitted from the bulb which is observed as visible light. If the current is varied slowly the output intensity of the light dims up and down. Because LED bulbs are semi-conductor devices, the current, and hence the optical output, can be modulated at extremely high speeds which can be detected by a photo-detector device and converted back to electrical current. The intensity modulation is imperceptible to the human eye, and thus communication is just as seamless as RF. Using this technique, high speed information can be transmitted from an LED light bulb.